By the fourth century, the Roman Empire was under attack by Germanic-speaking tribes from north of the Italian peninsula. Rome’s many roads made it easy prey for the Franks, the Vandals, the Lombards and the Goths, the Visigoths and the Ostrogoths to invade the Italian countryside. Those Germanic tribes moved into the empire because they were pushed West by the Huns, a violent band of nomadic warriors. 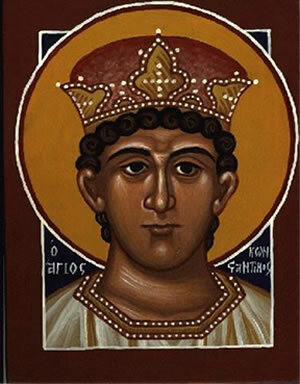 Emperor Constantine realized the city of Rome was vulnerable to attack. In 324CE, he began construction of a “New Rome" in Byzantium, a Greek city almost 1500 miles to the east. The emperor renamed the city “Constantinople," which means “city of Constantine." Roman civilization survived for centuries in Constantine’s eastern empire, while Rome and the empire’s western provinces fell to the Germanic invaders. 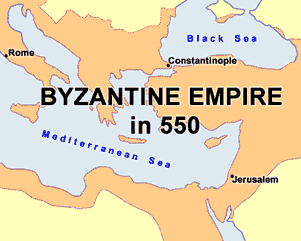 Historians refer to the Eastern Roman Empire as the Byzantine Empire. The Byzantine Empire included parts of modern Greece, Serbia and Turkey. The Byzantine Empire lasted until 1453, when it fell to Turkish warriors. The Turks brought their faith in Islam to Constantinople and converted many Byzantine churches to mosques. Constantinople is now known as Istanbul, Turkey. While the empire continued in the east, the city of Rome was under attack. Visigoth warriors overran “the Eternal City" in 410CE. One of them, named Odoacer, made himself emperor of Rome in 476. The city of Rome continued to exist, but the Western Roman Empire dissolved into many small kingdoms. Western Europe fell into a period of war and disease known as the “Dark Ages." Then, after about 1000 years, the region experienced a “rebirth" known as the Renaissance. The Renaissance was an era of invention and discovery that saw art, architecture, and science thrive. The people of the Renaissance revered the achievements of the ancient Greeks and the Romans. Renaissance scholars referred to the era of the Greeks and Romans as “the classical age," a term we still use today. View a Powerpoint presentation of this lesson. Listen as Mr. Dowling reads this lesson. Mr. Donn has an excellent website that includes a section on Ancient Rome. Constantine the Great was Roman Emperor from 306 to 337. 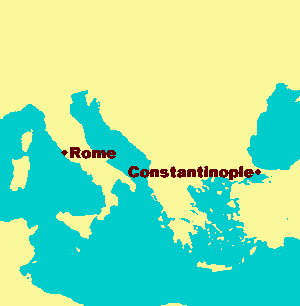 Constantine moved the seat of the Roman Empire 1500 miles east to the Greek-speaking city of Byzantium. He renamed the city Constantinople. The modern nation of Turkey renamed the city to Istanbul in 1930. Istanbul means “marketplace." The Byzantine was the continuation of the Roman Empire in the East until 1453, when it fell to Turkish warriors. 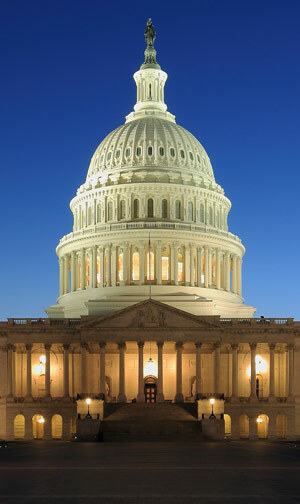 The Architecture of the United States Capitol in Washington, D.C. was inspired by the ancient Romans. This entry was posted in Ancient Rome. Bookmark the permalink.